JoAnn Kennedy, 90, of Williams, passed away peacefully in her home on Thursday, January 24 2019 with family by her side. Funeral services will be held at 1:30 p.m., Monday, January 28, 2019 at the First Presbyterian Church east of Kamrar, with Rev. Paul Fischer officiating. Burial will be in the church cemetery. Visitation will be at the Foster Funeral and Cremation Center from 3:00-5:00 p.m. on Sunday, January 27, 2019. 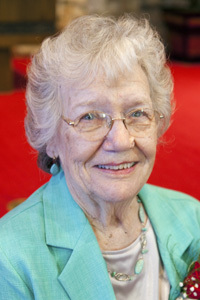 Nancy JoAnn Johnson, daughter of Calvin and Viola Buchanan Johnson, was born May 18, 1928 in Des Moines. She graduated from Williams Independent School in 1946 and worked for Equitable of Iowa in Des Moines. On August 4, 1948 she married her high school sweetheart, Leland Kenneth Kennedy in Williams. The couple farmed south of Williams where they raised their children Nancy and Kent. In 1965 they purchased the Johnson family farm southwest of Williams, retiring in 1996. In addition to being a farm wife, JoAnn was an active member of the First Presbyterian Church of Kamrar and particularly enjoyed teaching Preschool Sunday School. She was a Williams Hustling Homemakers 4-H leader and was a longtime member of the neighborhood club. JoAnn was also well known for her talent as a seamstress. JoAnn’s family was the joy of her life and nothing made her happier than spending time with them. Left to cherish her memory are her children, Nancy and Lon Hensley of Williams, and Kent and Pam Kennedy of DeWitt; grandchildren, Jason and Kim Hensley of Williams, Rachel and Quin Otteros of Williams, Nathan and Sarah Hensley of Rapid City, SD, Jordan and Katharine Hensley of Ames, Laura and Joe Dammann of Phoenix, AZ, Kathleen and Ryan Kedley of DeWitt, Andrew and Meredith Kennedy of Bettendorf; great-grandchildren Melanie and Justin Lemke, Devin and Katelynn Hensley, Sylvia and Ava Otteros, Ida, Val, Madge and Jones Hensley, Harrison, Elizabeth and Hazel Hensley, Emmett Dammann, Lucas, Cormac and Sullivan Kedley, and Everly Kennedy; great-great grandchildren Maddison, Morgan and Matthew Lemke and Emmalynn Hensley; brother Norman and Greer Johnson of Shelbyville, KY; and her dear church friends. JoAnn was preceded in death by her parents, her husband in 2003, and her brother and sister-in-law Warren and Betty Johnson. JoAnn’s unconditional love and support will be greatly missed by her family.